Legend has it that Irish sailors and fisherman brought this craft over from Ireland. Baskets were woven while at sea or to pass the time by lighthouse keepers. Some were used on a pulley system so that messages could be passed back and forth between loved ones. Many refer to them as nantucket jewelry, nantucket lighthouse baskets, Nantucket lightship baskets or just lighthouse basket jewelry! Call them what you like, we know what you mean! 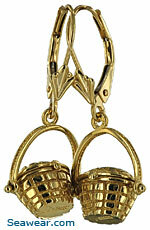 There are various other patterns and sizes from charms for a bracelet to opening baskets for pendants. A sailors basket. If you look close on the lid, you will see a schooner has been carved onto the top. Fixed bail on braided handle that pivots, lid opens. Basket is 1/2 inch across. Smaller nantucket basket, handle swivels, basket opens. 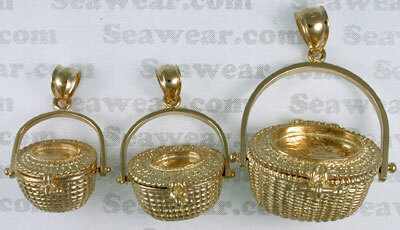 Small gold open top baskets. 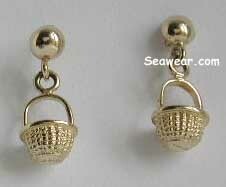 These are 3D and ideal size for a charm bracelet. Handle is fixed on the smallest one and pivots on the larger. 5/16 inch tall .7gms and 1/2 inch tall 1.1gms . 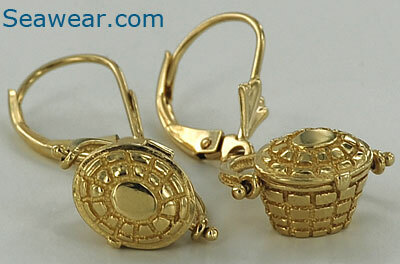 14kt leverback Nantucket basket earrings done in high polish 3D full round finished on sides. Total dangle length is about 1 1/8" or 30mm. Average weight is 4.4gms. Baskets do not open. 3D Nantucket light ship baskets or fish baskets joined together. 12 baskets in all, flat on one side so as not to roll. Baskets do not have lids and you can look into them. Match earrings. 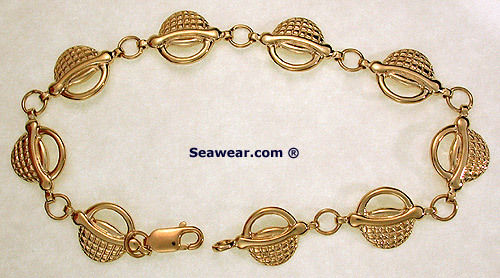 2D nantucket basket braclet. 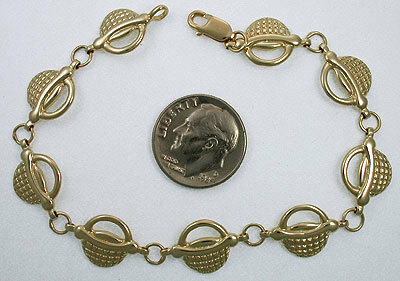 Solid 14kt with a secure lobster claw clasp. 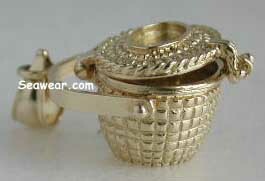 Nine nantucket baskets make up this highly polished detailed seven inch bracelet. 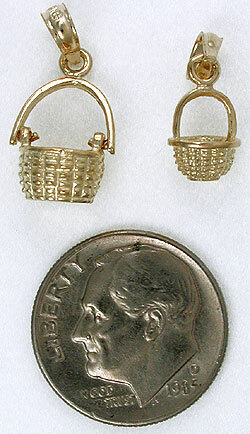 Baskets are 3/8" (10mm) tall.